Cathedral Chiropractic & Acupuncture is a friendly, modern and easily accessible clinic in the heart of Exeter – less than 15 minutes from Crediton. Based on 6/7 Southernhay West we offer the latest techniques to help diagnosis and treat our clients. We have established an excellent reputation in and around the Crediton area. Richard Gubbay, a graduate of 5 years Chiropractic training in Australia, has been in practice for many years. 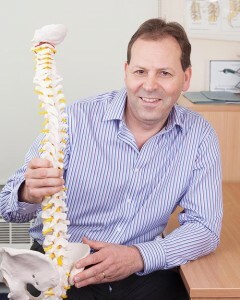 Richard is a member of both the British Chiropractic Association and the College of Chiropractors. Our clinic in Exeter is easy to find and easy to park near and we have many satisfied customers. Check out our Facebook Reviews and Google Reviews to view independent reviews of our service. Cathedral Chiropractic & Acupuncture offer a wide range of appointment times, from 8.20 am through to 7.30 pm, lunchtimes and most Saturday mornings. We are usually very busy but make sure that we keep some availability for clients who need an emergency appointment. Call us on 01392 221122 or complete our enquiry form to arrange an appointment.